I don't remember a time when I haven't liked Studio Ghibli movies. Their style and stories keep me coming back for more... sometimes in tears but mainly with a smile on my face. 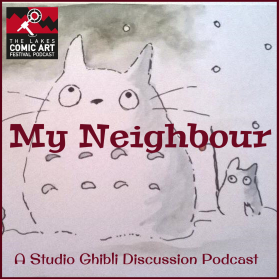 I've started a new second podcast where Ian and myself talk about a specific Ghibli movie every episode. Check it out here. It's called My Neighbour. The logo for the podcast which I painted. You can also find it on iTunes here. Have a listen and give us feedback on the show and the movie in question for a shout out.